On July 7, legendary rock vocalist Graham Bonnet will release a new live album and home video captured during his acclaimed performance at Frontiers Rock Festival III in Trezzo (Milan), Italy) on April 24, 2016. Accompanied by a stellar band, featuring founding member Beth-Ami Heavenstone on bass, South American guitar sensation Conrado Pesinato on lead guitar, and Mark Zonder (known for his work with Warlord and Fates Warning) on drums, Bonnet masterfully delivered a thrilling "best-of" set which included songs from his stints with bands such as Rainbow, Michael Schenker Group, Alcatrazz, Impellitteri, and, of course, his solo material too. Bonnet has a powerful and distinctive vocal style and, indeed, a distinctive image — preferring to let the music, rather than the conventional heavy metal look, do the talking. 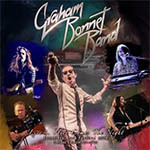 The Graham Bonnet Band has spent the last two years touring regularly around the world, and this past winter released an album titled "The Book". With the band and Bonnet finetuned from all their touring when they got to Frontiers Rock Festival, this stellar set that was captured there makes for a new live album that will blow Graham Bonnet Band fans (and heavy rock fans in general) away!